Cable Cars is a worldwide symbol of San Francisco and riding on one is just a San Francisco thing to do. Hop on a historic cable car for a ride around the city. Hold on tight as you climb some of San Francisco's steepest hills. There's nothing like hearing the famous Cable car bells ring along the way. The historic cable cars operate seven days a week daily from 6am - 12:30am. There are three cable car lines: the Powell-Hyde Line, the Powell-Mason Line and the California Line. Powell-Mason line also begins at Market Street with a stop at Union Square and continuing over Nob Hill. Powell-Mason line ends at Bay and Taylor Street in Fisherman's Wharf. 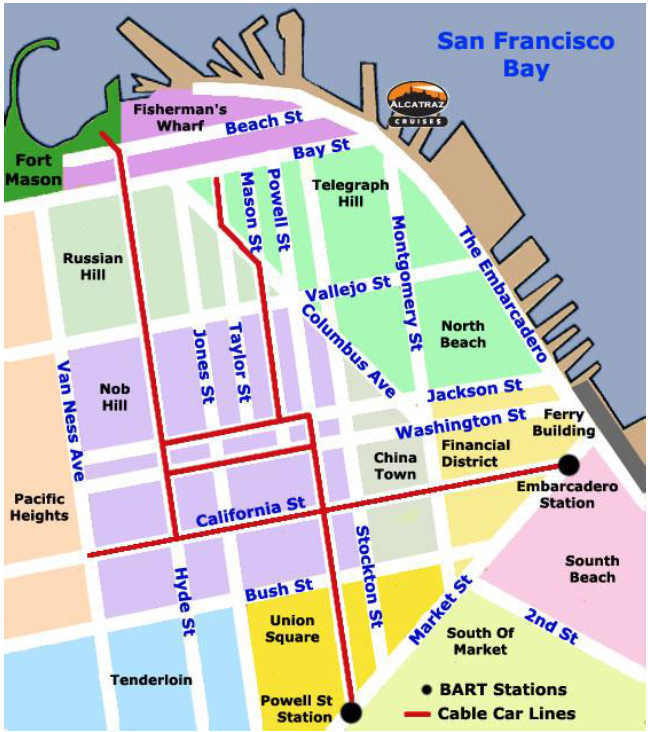 The California Street line runs east-west from Van Ness Avenue, through Chinatown, and over Nob Hill to the Financial District. It crosses the Powell-Mason and Powell-Hyde lines at California Street/Powell Street in Nob Hill. Pay on-board to the Cable Car conductor. Transfers between cable cars are not available. Cable Car Transfers: No transfers/fare receipts are accepted on Cable Cars. An All-Day Passport is sold for $20 by the conductors on the cable cars. This passport is equivalent to a 1-Day Passport only on the day sold. You may want to purchase this if you will be riding more than one cable car vehicle, e.g., transferring between a Powell line and the California Line, as well as riding other Muni vehicles. ***Exact change for your cable car fare is appreciated. The conductors can make change for up to $20. Clipper® cash and monthly passes are also accepted on cable cars. It's important to know that Cable cars are very popular and can get very crowded. You can board a Cable Car at any cable car turntable which are located at the beginning and end of each route or simply hop on anywhere a brown and white stop sign is posted (if there is enough room). On the Powell Street Cable Car route, the signs are color coded. The yellow signs head towards Bay and Taylor streets, and the red signs head towards Aquatic Park. Always wait for the cable car to come to a complete stop before standing up to exit or stepping off the cable car. If you ride the Cable Car by standing on the outer running boards, you will be doing so at your own risk. Popular Question: What is the difference is between a San Francisco Cable Car and a Street Car? Answer: Cable Cars in San Francisco runs on steel rails with a slot between the tracks and no overhead wire. Street Cars on the otherhand has a trolley pole that connects them to an overhead wire. Do you know ... San Francisco Cable Cars are the only moving national historic monument you can still ride on.